The U.S. Embassy is no closer to moving to Jerusalem from Tel Aviv, as Prime Minister Benjamin Netanyahu's government wants. WASHINGTON: Israeli leaders hoping President Donald Trump would be a rubber stamp for the Jewish state are hearing plenty of reassuring rhetoric at this week's annual gathering for the "unbreakable" alliance. Missing from the agenda: Concrete steps advancing the Israeli government's top priorities. The Iran nuclear deal, so despised by Israel, is solidly in place. The U.S. Embassy is no closer to moving to Jerusalem from Tel Aviv, as Prime Minister Benjamin Netanyahu's government wants. As it has under past presidents, Washington is still telling Israel to slow settlement construction. 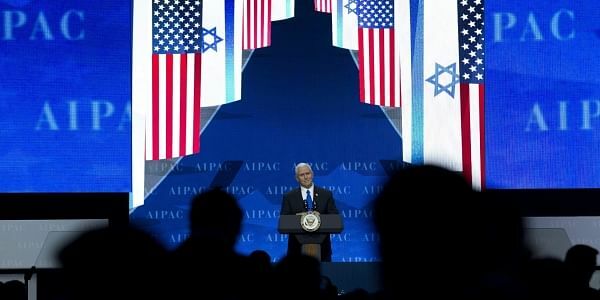 It is making for an unusual American Israel Public Affairs Committee conference, one relieved of the strains that marked the last years of President Barack Obama's tenure but also filled with significant uncertainty. Netanyahu on Monday called the U.S.-Israeli relationship "stronger than ever." His ambassador to the U.S., Ron Dermer, said a day earlier that for the first time in years or even decades, "there is no daylight between our two governments." Vice President Mike Pence said he and Trump "stand without apology for Israel and we always will." But it's too early to tell whether Trump will ultimately fulfill Israel's wishes. And there are indications he's reconsidering several stances adopted during the campaign. As a candidate, Trump repeatedly vowed to be the president to finally relocate the embassy to Jerusalem, which Israel considers its capital. As Pence said Sunday, that unequivocal promise has morphed into Trump now "giving serious consideration to moving the American embassy." While candidate Trump said he'd renegotiate or dismantle the Iran nuclear deal, which Israel fiercely opposes, President Trump's administration is continuing to implement the accord while examining whether it should stand. On Iran's missile program, however, Trump has expanded U.S. sanctions. Netanyahu has taken some reassurance from the fact that Trump's budget proposal safeguards every penny of Israel's $3.1 billion in U.S. assistance, even as it seeks to slash foreign aid overall. And while the Obama administration stung Israel by allowing a U.N. resolution critical of Israel to pass in Obama's final weeks, new U.N. Ambassador Nikki Haley has pledged not to let that happen again. The biggest question mark may be Israeli-Palestinian peace efforts. On that matter, Obama and Netanyahu struggled to speak with a unified voice. Trump has shown significant flexibility — stunning many last month when he broke with decades of U.S. policy by saying the U.S. could live with a one-state solution, rather than a two-state solution involving Palestinian statehood, if both Israelis and Palestinians agreed. Now Trump and the Israeli leader are both speaking vaguely of a broader Middle East package. Israel's Arab neighbors, who traditionally opposed Israel but have realigned because of common concerns about Iran — would serve as guarantors. "The common dangers faced by Israel and many of our Arab neighbors now offer a rare opportunity to build bridges towards a better future," Netanyahu said. Trump's diplomacy in the region appears to be gaining speed. As Netanyahu spoke to the AIPAC conference by video from Jerusalem, White House envoy Jason Greenblatt was headed to Jordan to attend an Arab summit, according to a U.S. official who wasn't authorized to discuss the trip publicly and requested anonymity. Greenblatt, Trump's longtime business attorney, will be an observer at the summit, but plans to use his visit to discuss the type of regional approach to the Israeli-Palestinian conflict Netanyahu and Trump have floated. While in Amman, Greenblatt plans to meet with Palestinian President Mahmoud Abbas and the foreign ministers of Saudi Arabia, Qatar, the United Arab Emirates, Tunisia, Morocco, Jordan and Algeria, the U.S. official said. Another issue central to the conflict — settlements — remains a work in progress for Israel and Trump. The president's softer campaign tone about Israel's construction of Jewish homes in east Jerusalem and the West Bank has been replaced by Trump's suggesting in his first White House meeting with Netanyahu to "hold back on settlements for a bit." At that meeting, Trump and Netanyahu voiced confidence they could work out an understanding, while providing few hints how. A visit by Israeli officials last week ended with a public statement saying Israel would take Trump's concerns "into consideration" and pledges by both countries to keep talking.